During the months I spent taking pictures for the recent post about the Fauxtopias of the Detroit Suburbs, I spent a lot of time driving around those liminal spaces between Detroit's exurban communities and the Michigan countryside, and one afternoon I was driving on some dirt roads and came across a huge landfill with hundreds of trucks approaching and turning into the facility to drop off their loads. 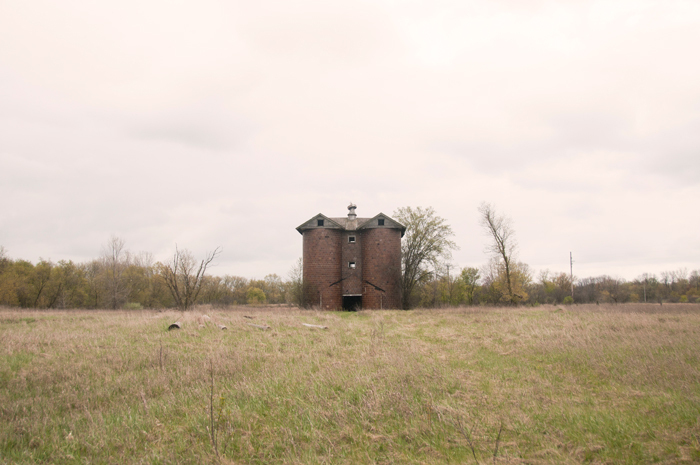 Across the street I saw this sturdy old building, which I assumed was some kind of grain storage or something. I really liked the black pitch marks forming the roof line of an adjacent building that must have been torn down at some point. I see that all the time in Detroit (here's my favorite).